Officials said the suspect entered SunTrust Bank inside a Safeway in Gaithersburg and demanded money from the teller. The suspect then fled with the money. Montgomery County Police Department needs your help identifying a man who they say robbed a bank inside a grocery store in Gaithersburg Saturday morning. Police said they responded to the SunTrust Bank inside the Safeway grocery store in the 12000 block of Darnestown Road for the report of a bank robbery. According to a police report, the suspect entered the bank and gave the teller a note demanding money. 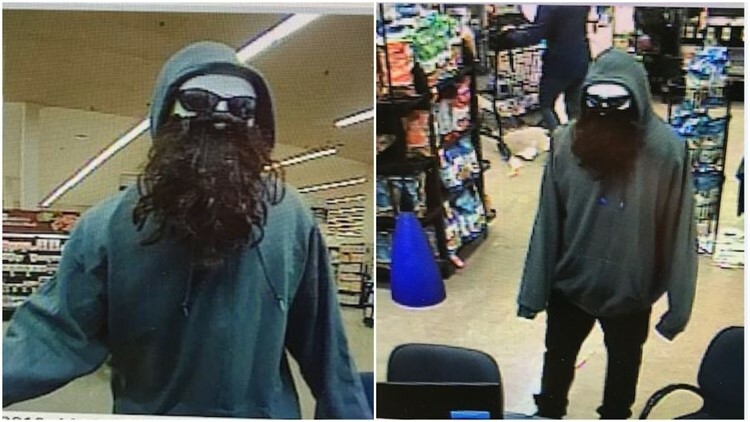 The man had what appears to be fake long black beard with a white mask and dark sunglasses. He was also wearing dark pants and an over-sized green hoodie. The suspect fled the bank with the money heading toward the back of the shopping center near Nursery Lane and Orchard Grove Road, according to police. Officials are asking anyone in the area of this incident, specifically McDonald Chapel Drive, Nursery Lane and Orchard Grove Road, who may have seen the suspect to contact them at 240-773-5100. Police are also looking for any video footage of any suspicious people or vehicles in the area between 10:30 a.m. and noon on Saturday. Anonymous tipsters can call 1-866-411-TIPS (8477).